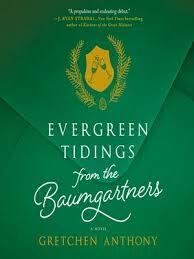 Welcome to this stopover of the TLC Book Tour for Evergreen Tidings from the Baumgartners. I received a complimentary copy of this book from TLC and the publisher for this review. All opinions, exclamations, gushings and rants are my own. Gretchen Anthony is a Minnesota-based writer and humorist. Her debut novel, Evergreen Tidings from the Baumgartners, will be released October 16, 2018 by Park Row Books. After a career in management consulting and corporate communications, she left the cubical world for the writing life. As a ghostwriter, she has been the voice for some of the best brands in the United States, from CEOs to doctors and start-up superstars to BBQ pros. If Evergreen Tidings had been set in the 50s, 60s, 70s or even 80s, I might have been able to connect with it a bit more. But since it is set in present day suburban Minnesota, I had some issues. Let me describe the characters first. Richard: Richard is the odd-man-out here. He is the husband of Violet’s best friend, Eldris. (Eldris brings another whole set of neuroses to the book. No wonder she is Violet’s best friend.) He has just been laid off from a lucrative senior VP position and is struggling to find his place. Ironically, Richard brings a sense of reason to the narrative. The novel is told from these three characters’ perspectives. To round out the cast of characters, there’s the aforementioned “dear Ed,” Eldris and Barb. Kyle (Cerise’s best friend) and his fiance, Rhonda, a whack-job all her own, are thrown into the mix as well. My biggest issue with the book was the time warp I felt. I understand that the stereotypical Midwesterner involves “images of devout hardworking folks dressed in muted colors and driving American cars” (38). But, surely Minnesotans are active participants in the 21st century. As I read Violet’s yearly holiday letters (which was a clever way to structure the novel), I was struck that I was reading something written by a 1950’s housewife. Violet’s whole goal of domestic goddess-dom and the image of the perfect family also hearkened back to a much earlier era. Violet’s quest to find out how Cerise became pregnant is a bit annoying and antiquated as well. Violet, Cerise is giving you a grandchild who will have loving parents. Does the biology behind the pregnancy matter? Violet’s perfect dinner party (circa 1985) complete with lots of wine, tranquilizers and flying lamb chops. The more-than-raucous christening where noses are broken and words are uttered that have never been heard by Pastor Norblad. I really wanted to compare this book with We’re All Damaged by Michael Norman (which I found pee-in-my-pants funny), but I could not. I think the publisher’s blurb got it wrong. Although I think Anthony’s writing and plot is clever, I could not get past the obvious time warp. But, it is a fun ride. Because I am sure that Violet followed Martha Stewart’s career closely (that is until she became a convicted felon), I delved into Martha’s site for this recipe. It is mostly “strictly Martha” except I added the black olives, zest and red pepper flake. Place ingredients in the bowl of a food processor. Pulse until a coarse paste forms. May be stored in an airtight container, refrigerated, up to 1 week. It won’t last one week at all! This recipe is a quick and easy and delicious appetizer. I will keep this one in my bag of tricks. For a full list of food in Evergreen Tidings, keep reading. For all my TLC Book Tour reviews, click here. Because of the whole “olive sandwich” angle, I am linking up with Deb’s Souper Sunday (with sandwiches and salads)! I am also linking up with Foodies Read. Please check out the others on the tour. I haven’t made or had this olive spread in a while….time to prepare a batch too! 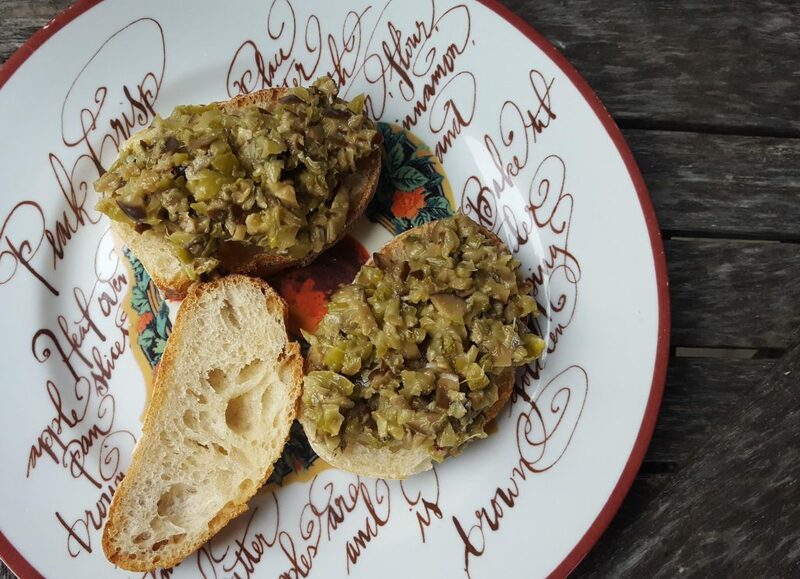 Thanks for sharing this delicious crostini recipe, Deb. Good review. Doesn’t sound like something I’m bursting to read — not really my kind of book. My kind of recipe, though. Love tapenade — and yours looks excellent. Thanks. I love olive tapanade. It would never last a week here either. One appetizer/cocktail hour on Friday and it is GONE! I think I’ll pass on this one but pass the tapenade please. We are true tapenade fans here now with this recipe! I almost took this book but signed up for a couple other holiday reads instead. The food sounds tasty though and I adore a good tapenade. Your crostini and the olive sandwich look delicious. Thanks for sharing with Souper Sundays this week! I too like both black and green olives in my tapenade. Now where is that Martini? I always enjoy reading your reviews, Debra. I like your reference to Martha Stewart. 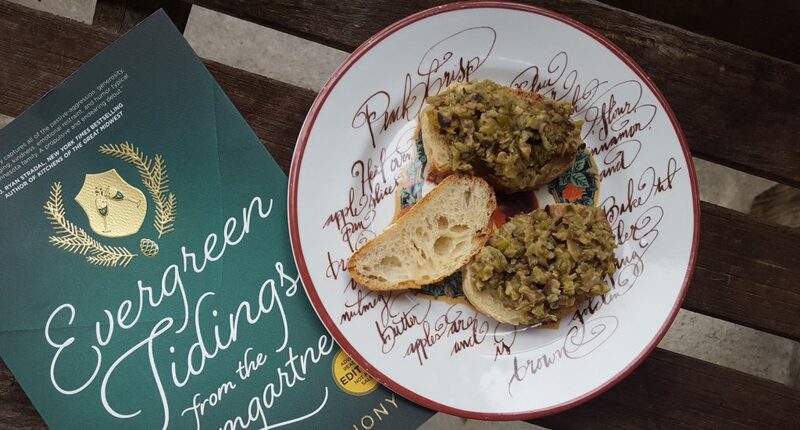 Great choice of recipe: how can anybody fight when there is tapenade and crostini to enjoy? 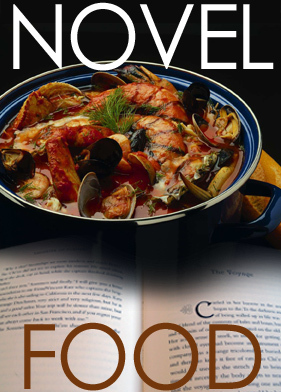 Thank you so much for contributing to Novel Food! That sounds like a great idea. Will try it.